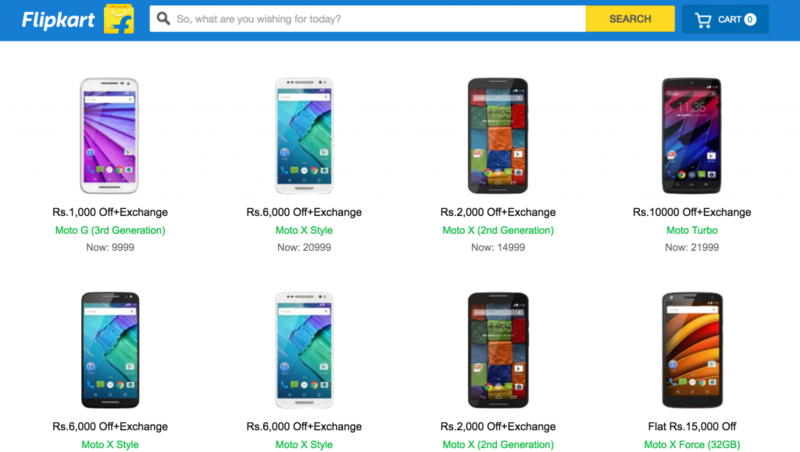 Flipkart Announces Huge Discounts On Motorola Phones, Sale or Rivalry? Indian e-retail giant Flipkart has always been in a clash with Amazon India when it comes to discounts and offers. The consumers adore the sweet rivalry between the two companies as they are the one who is being benefited with tempting offers every week. Moto X Force has got a price-cut of Rs. 16,000 and is being now sold at Rs. 34,999 for 32GB variant and Rs. 37,999 with 64GB storage. 3rd-Gen Moto G (2015), Moto G Turbo Edition each got a price cut of Rs. 1,000 and are now available for Rs. 9,999 and Rs. 11,499 respectively. The white variant of the Moto G Turbo Edition is now selling for just Rs. 10,499. 2nd-Gen Moto 360 also received a price cut of Rs. 1,500 on the original price and now starts at Rs. 19,999. When we first witnessed the news about the discounts, it was a bit hard for us to believe why Motorola is following such strategy at the time when they have launched a fresh smartphone in the market. When investigated, we got to know that Motorola is not advertising about the discounts anywhere; else it would have released a press note for the same. So the question is- Is this official price cut by Motorola? As you have read the official statement, the answer to the question is very clear. The discount on Motorola products has been offered by Flipkart itself. So before it gets more confusing, we’ll help you understand what has happened. Lenovo owned Moto is selling the new Moto G4 Plus exclusively on Amazon, but before this, Flipkart was the exclusive online selling partner of Moto phones. Motorola has been a key brand for Flipkart when it comes to smartphones and the taste of its breakup with the company will surely be unpleasant. We cannot label it as an act of vengeance but if we look at it from Motorola’s end, the intensions of the e-retailer were not on the positive side. Cutting down the prices of Motorola phones will surely hit the sales of the new Moto G4 Plus. A lot of consumers will be dissected towards the sale and Moto may miss the kind of start they were expecting. Reacting to this, Motorola has cleared its intensions that it is not going to take this case for granted and will surely question Flipkart about the issue.